Rival Palestinian factions are reported to have agreed a truce to end fierce fighting in the Gaza Strip. 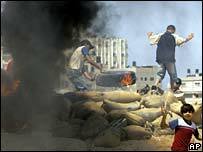 Hamas and Fatah made a deal after two days of bitter street violence, government spokesman Ghazi Hamad said. However, past agreements have failed to hold and there were sporadic gunfights on the streets overnight, in which a Hamas member was reported killed. Nine people have died since Sunday, with 30 others injured, in the worst outbreak of violence in several months. The Palestinian Authority mobilised all of its security forces in an attempt to end the street battles on Monday. Egyptian mediators were said to have negotiated a deal on Sunday night, but Monday brought renewed fighting. Interior Minister Hani Qawasmi resigned on Monday amid the violence, prompting Palestinian Prime Minister Ismail Haniya to take personal control of security in Gaza. The rival groups agreed a truce after a meeting late on Monday night, Mr Hamad said. The BBC's Aleem Maqbool in Ramallah in the West Bank says it will be a difficult task for any politician to control all the disparate security forces and Palestinians fear this round of violence has not yet run its course. Information Minister Mustafa Barghouti asked for the co-operation of the rival factions in the new security measures. "The government decided today to deploy immediately security forces under control of the joint operation room and under the control of Prime Minister Ismail Haniya," he said. "The government is asking all factions, Hamas and Fatah in particular, to support the government in this and not create any obstacles to this effort." Hani Qawasmi, an independent, had offered to resign last month in protest at worsening security, but was persuaded to stay on. However, he is reported to have faced competition from powerful Fatah rivals for control of armed factions. Sunday's violence - with five dead and 18 injured - was the worst in a single day since February. Three people were killed and at least 10 wounded as rival factions exchanged fire on Monday morning. Up to 400 people have died in clashes between the two factions since the militant Hamas movement won last year's parliamentary elections. Senior Palestinian negotiator Saeb Erekat described the violence, together with the abduction of BBC journalist Alan Johnston nine weeks ago, as "despicable scenes". "I am ashamed as a Palestinian this morning to see the continuation of such chaos. If the government cannot deliver on this one authority, one gun, the rule of law, I believe there is no purpose to have a government," he told the BBC. Since the Israeli withdrawal from Gaza in 2005, the strip has seen a wave of infighting, armed robberies, deadly family feuds and kidnappings.